When the film industry’s biggest production companies come calling they come calling for Kriss ‘The Dish’ Brown. And when The Dish comes calling for satellite technology he comes calling for bigblu. The latest addition to Kriss’ fleet of satellite services is his new fully equipped SNG truck. 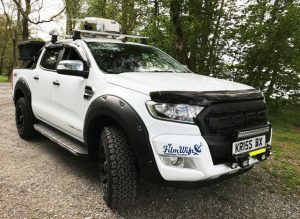 This robust vehicle allows Kriss’ company, Film Wifi, to deliver broadcast and production solutions to his clients in hard-to-reach inhospitable terrain. It is ideal kit to have when those clients include the film production companies responsible for blockbusters including Spectre (James Bond), Mission Impossible, The Kingsman and Dunkirk. You only need to look at the strength and depth of Kriss’ satellite experience to know that the satellite technology he chooses can be trusted. To detail just some of that experience, it was Kriss who was responsible for making sure George Clooney and Sandra Bullock could watch satellite TV in their trailers in the middle of nowhere; it is Kriss who helped get Sol Campbell connected with satellite broadband; and Camp Bestival would not get connected without Kriss and his company. Film Wifi owns a large stock of satellite dishes to support film units working in the UK and across Europe. Kriss lorry holds a complete suite of equipment including sleeping quarters so his company can deliver a range of services to production crews operating in often remote environments. And Kriss has delivered services in: England, Wales, Scotland, Isle of Sky, Isle of Mann, Lundy Island, Ireland, France, Holland, Austria, Malta, Spain & Morocco. To find out more about our IPTV Broadcast services contact Selwyn Petterson on +44 (0)1869 222 900 or or email him at selwyn.petterson@bigblu.co.uk.